Visible disappointment for Dolderer there, he's clearly in it to win it already this season. Go Matt Hall. 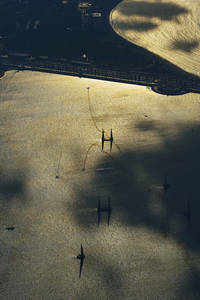 Fly fast and smooth. Marking Matthias time again. But it's not a good start for Hall... Gate 6 catches him out! Maximum G for going over 12G and it's a DNF for the Australian. He's furious! Maybe a lesson learned ahead of tomorrow's racing? Czech pilot Petr Kopfstein next up. Kopfstein looking on great form out there, but the pace isn't quite matching up to Dolderer's top time, he's 1.5s off the pace and just not getting the speed in the last few gates. Kopfstein 54.336, placing him in 5th place overall so far. Kopfstein'll be looking for a solid performance today, but again the call to knock it off comes, Petr Kopfstein's second run comes to an early end and heads back to the airport with a current placing of 5th overall. Lots of over-G here in Abu Dhabi... the remaining pilots will be getting the message and it'll be interesting to see how the different gameplans will play out. Middle of the field isn't such a bad placing for the racing heats tomorrow... currently Matt Hall has the toughest job so far, with his DNF result pitching him against the fastest pilot. 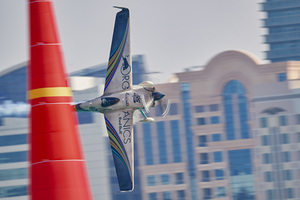 Chambliss, McLeod, Sonka and Muroya still to fly. Everybody is comfortable here because we've been training this whole week. We've had a plan and we're sticking to that plan, and we're just going to try to get everyone to catch us. Now I think we have a great airplane and we just have to equal its performance. Chambliss hasn't touched 52s yet in free practice, but he's pretty fearless and has a raceplane capable of a really fast performance. Chambliss off to a GREAT start... flying through the track and keeping it solid and simple, but the numbers aren't adding up, as the splits go RED RED RED across the board and Dolderer's race plane maintaining the lead. 5th place currently for Chambliss, no penalties but those vertical turning manoeuvres look a bit conservative. 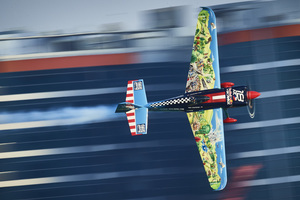 Chambliss returns for his second attempt, he's 0.103 ahead of Dolderer in the first split, but despite some smooth and rhythmic flying, he's just not finding the pace... looks like a slightly different tactic here, but it's not working for the American Pilot. No real improvement on that lap and Chambliss obtains a fourth place overall so far. That over-G at Gate 6 is proving to be a real sticking point. McLeod in 10th place overall so far. Without that penalty mcLeod would be looking to a top 5 place. McLeod told to knock it off for exceeding Max G! McLeod will have to make do with a 10th place overall so far. That'll pitch him against some of the fastest flyers tomorrow. A great run for Sonka, more fight and more pace there. Yoshihide Muroya last to head into the track for Qualifying... last year's World Champion is back to retain his title! Muroya wil need to get a solid result in his first run, but he's playing catch up throughout the track and he appears to be flying cleanly but no real attack in that run. he goes into the middle of the pack with a 6th place finish for his first run... 1.256s off Dolderer's winning Qualifying time. Can Yoshi challenge Matthias for a first place finish in Qualifying? He's definitely upped the pace, and Muroya is taking a typically disciplined approach and although the pace isn't matching Dolderer's, it's a great run for the Japanese pilot and we're set to see a much better result. - Master Class newcomer Ben Murphy took an impressive 9th place finish in Qualifying – definitely one to watch on Race Day! - It's a Czech head-to-head in the Round of 14, as Sonka and Kopfstein face off! 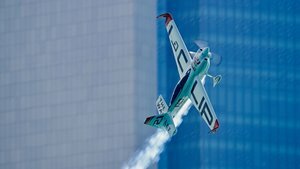 - Top three: Dolderer, Goulian & Muroya... could Goulian take a podium finish in Abu Dhabi? am i not able to watch a repeat of quali? 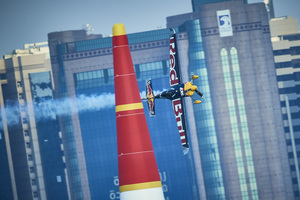 Red Bull Air RaceAll the training sessions are complete, tomorrow we race! That's all for today but we'll be back with you tomorrow for the first Race Day of 2018! Join us from 1215 local time! Good morning from a gloriously sunny Abu Dhabi where Race Day is about to kick off!